"Spoilers"? I doubt it. 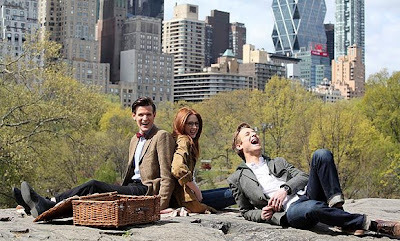 By the night it aired everyone and their tin dog knew all too well that "The Angels Take Manhattan" would be the episode that saw wife-and-husband companions Amy and Rory (Karen Gillan and Arthur Darvill) taking their bows from Doctor Who. So what did this blogger think of the second Doctor Who story that the BBC has filmed in the United States? I think that writer and showrunner Steven Moffat gave Amy and Rory a fine and fitting close to their part in the Doctor's epic mythology, with as much happiness as two people in love with each other could possibly have. At the same time, with more and more time passing since watching it I can't help but think that this story felt too fast-paced and blurring, especially toward an event which by every measure should be forever burned into the gestalt consciousness of the Whoniverse. And then there is the point which will probably have people jumping flunky on me from all quarters: I honestly think that of the stories to date featuring the Weeping Angels, this was certainly the weakest. Look folks, I am madly in love with the Weeping Angels so far as Doctor Who enemies are concerned! In a television show that has become as famous for its monsters as it has for its hero, the Weeping Angels stand as the most original and absolutely the most horrifying of the lot. Far more so than the Daleks and the Cybermen, even. In fact, I'd dare say that the Weeping Angels are the most frightening creatures in any modern fiction, period. They're such a terrifying and unique concept that I'm even attempting to write a fan-fiction story about them, so don't anybody say that I don't appreciate them! But in "The Angels Take Manhattan", well... the Weeping Angels also came across as rushed, to the point of being - dare I say it - underwhelming. Maybe it's a consequence of how this season is being structured. Moffat has stated a few times that Season 7 (or 33 depending on what you're incrementing from) would be a solid slate of one-episode stories. Based on the season so far, I'm beginning to suspect that wasn't a wise decision. "Asylum of the Daleks" and "A Town Called Mercy" definitely worked without having to span multiple chapters. But then there have been "Dinosaurs on a Spaceship" and last week's "The Power of Three": stories that perhaps had potential but were shoehorned into less space than they deserved (okay, I don't know if anything could have helped "The Power of Three"). "The Angels Take Manhattan" is now the most glaring example of this problem, especially when one considers how last year's amazing "The Impossible Astronaut"/"The Day of the Moon" worked as the first Doctor Who story made on American soil. In retrospect it seems that selling-point was the biggest thing "The Angels Take Manhattan" had going for it... and gimmicks like that, however well intended, should never trump plot or pacing. I'm not even going to begin to touch upon this episode's inordinately considerable amount of plotholes and inconsistencies. And just how does the Statue of Liberty go missing without anyone noticing it? Did illusionist David Copperfield have an uncredited cameo where his swimsuit-clad assistants hoisted a black curtain to hide the Statue from observation so it could go stomping off to Winter Quay? And how does a copper and steel colossus with hollow innards become a Weeping Angel, anyway? River Song, with the ever-enjoyable Alex Kingston in the role, seems like a tacked-on addition to the episode. For someone who is the Doctor's wife and with such a major change-up at hand, River Song deserved better. I'm gonna have to say that "The Angels Take Manhattan" fulfilled its mission of giving Amy and Rory a proper send-off. But the lead-up to that moment could have been immensely more memorable... and far less confusing. "The Angels Take Manhattan" gets Three Sonic Screwdrivers from this blogger: not a bad episode, but not overwhelmingly "great" either. And with that, Doctor Who returns with the now-traditional Christmas special airing December 25th! And what happened to the final angel in the graveyard?